This page is for the original release. For the remastered edition, see Bulletstorm: Full Clip Edition. No longer sold digitally due to the release of Bulletstorm: Full Clip Edition. Zero Day Protection software in place can have issues connecting on Windows 10, making the game impossible to launch. Install the patches to fix this lockout. DLC is no longer sold (could only be purchased through the Games for Windows Marketplace). You need to have GFWL client installed in order to apply updates 2-3. Can only be used in single-player. Configuration files are encrypted; edit with Bulletstorm INI Editor. 4:3 and 16:10 are letterboxed; use Flawless Widescreen or Widescreen Fixer. Subtitles do not scale with resolution and are extremely small. Default FOV is 85°. See Field of view (FOV). Set in options or use -windowed parameter. Default is 4x. See Anisotropic filtering (AF). Up to 8x MSAA. Using injectSMAA is recommended, because it smoothens the edges of 2D objects, like plants and foliage. Capped at 62 FPS by default; see High frame rate. 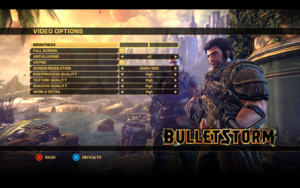 Open StormEngine.ini with Bulletstorm INI Editor. 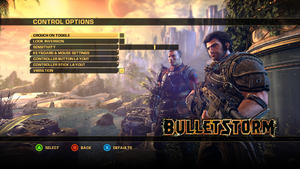 Open StormCamera.ini with Bulletstorm INI Editor. Change these values to the desired world and aiming FOV, respectively. Launch the game in fullscreen mode. 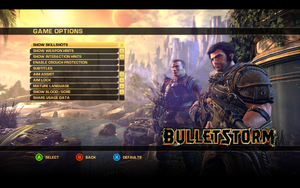 Open %USERPROFILE%\Documents\My Games\Bulletstorm\StormGame\Config\StormEngine.ini with Bulletstorm INI Editor. Change MaxSmoothedFrameRate to a higher cap; alternately, remove the frame rate cap entirely by setting bSmoothFrameRate to false. Save the changes and close the editor. There are two instances of these settings, one under [Engine.Engine] and again under [Engine.GameEngine]. 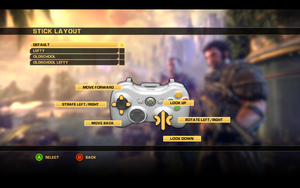 In-game gamepad button layout settings. In-game gamepad stick layout settings. Delete cannot be bound to commands. Can choose between three presets. 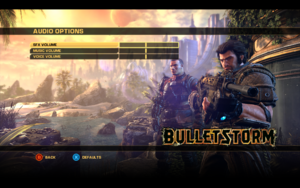 Open StormInput.ini with Bulletstorm INI Editor. This also disables the delayed movement of the player weapon model while looking around. Change MouseSensitivity=60 to the desired value. Change applies to base sensitivity as well as ADS, however changing the value to ~10 makes both sensitivities feel similar. If you wish to use a different button, replace RightMouseButton with an alternative keybind. Use Helix Mod: Bulletstorm to improve 3D support. The official game-specific 3D Touch Add On is required. Save the file as read-only. Some GPUs are not supported by the default configuration files which causes strange graphical errors (black bar shadows, blocky shadows, low texture resolution on all settings, and 16-bit colors). This method is used to fix these errors. 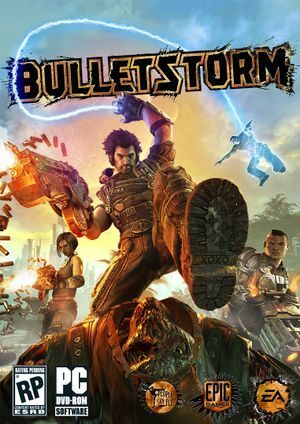 Make a backup of DefaultCompat.ini in <path-to-game>\Bulletstorm\StormGame\Config. Replace DefaultCompat.ini with the modified file. 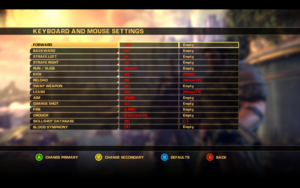 Start Bulletstorm and change any graphical setting to apply the change. ↑ Games for Windows - LIVE DRM features: SSA+ZDPP activation, requires a Microsoft account - local profiles are not supported. ↑ 3.0 3.1 File/folder structure within this directory reflects the path(s) listed for Windows and/or Steam game data (use Wine regedit to access Windows registry paths). Games with Steam Cloud support may store data in ~/.steam/steam/userdata/<user-id>/99810/ in addition to or instead of this directory. The app ID (99810) may differ in some cases. Treat backslashes as forward slashes. See the glossary page for details. This page was last edited on 15 April 2019, at 19:52.